This is the first ever AnalyticsToday interview podcast where we have a very special guest. In this podcast, we will interview Dave Rigotti (VP of Marketing at Bizible) and ask him really interesting and tough questions about marketing attribution, his company Bizible and get the details that will help marketers take their attribution to the next level. Another big announcement is our new podcast website is live – http://www.analyticstodaypodcast.com. Q1. What is Bizible and what do they do? Bizible is all about connecting marketing to revenue and we do that with looking at what has happened in the past and connecting that to sales opportunities and pipeline revenue with a concept called attribution. We take all marketing actions and the value of all the interactions you’re having. We also take into consideration the cost side of it as well. As an example, here is how much cost to have an interaction and then ultimately to determine the ROI of all marketing efforts. We do that by looking at the attribution and then we recently started doing is connecting much more closely to revenue. So marketers have the answers and can run through different media mix scenarios and have a much bigger voice at the revenue table alongside the finance. Q2. Are you seeing marketing playing a key role in the overall company decision making process than before? In the B2B space, the concept of performance marketing and attribution was foreign to majority of people even four years ago. Today, the conversations are moving to how do I use attribution more effectively to drive demand. The CEOs and sale leaders are demanding that marketing align with the rest of the organization on a common metric which for everyone else the organization is revenue. I think we’re you’ve also seen some company that where marketing didn’t had a seat on the table and they would promote sales leader to Chief Revenue Officer role. It’s pretty amazing to see how the industry is changing and how the average digital marketer today knows infinitely more about terms like attribution or multi-touch. Rather than talking about just simply terms like first click and logical contribution. It is becoming extremely important to empower the team to understand what it means and the difference between attribution model and why it matters. Q3. Can you explain more about your role at Bizible? I am the VP of marketing at Bizible and I lead the marketing teams here. I’ve been here for four years now and the first marketing hire and sort of my career has grown as our company has grown. I lead everything that’s not product marketing such as growth marketing, everything from our partner channel to demand generation fuel marketing. I find that I’m constantly in learning and teaching mode. I really enjoy learning from our customers and how they think about the state and what they’re doing. I really enjoy learning from our product team and kind of one of the really cool benefits of doing marketing to marketers and having a software for marketers is you get to play around with it. First, they’re educating me about new areas the product and I’m kind of in that learning. Then, you had to educate your customers on how to use your products. So, it is one of the really fun aspects of my job is to be like literally the first person on the planet who’s doing something new and exciting with them. There’s certainly an extra element of pressure in marketing to marketers, and I think any anyone who is in the tech space will tell you that we hold ourselves to a high bar. Like anyone who’s marketing the marketers your marketing is constantly being judged. So, we’re chatting with really smart people, and we’re chatting with people who really have complex needs and I think that it creates more challenges. However, I think that’s way more exciting. Q4. What made you to move from Microsoft to Bizible? It’s almost opposite being part of a realization that a you are moving from organization with hundred thousand people and to an organization that had eight people in when I started at Bizible. I got an offer to join Microsoft right out of college and I was truly blessed to get the offer. Then you realize you have a lot to learn, and that’s a fantastic place to learn. It’s just so big and there are so many really smart people in tech. I had a really good time there. I spent almost five years there and learned a lot more than I thought I needed to learn and I knew a lot of things. Then I decided to move to a smaller company, and I was super picky about what company I want to work for and I didn’t just wanted to go work for a startup. I wanted to work for companies that are actually solving problems for their customers and that led me to Bizible. It has been quite a ride and here for four years and I’m sure I’ll be here for another four years. I think it’s partly a personal desire to go to a startup and to do marketing to marketers. I am very glad I made that choice. Q5. Where does Bizible fit in the marketing technology stack? There are two ways to think about the individual tech stack and then how you see the marketing technology landscape for the company. We think of sales and marketing tactics as one. So, we really care deeply about sales and marketing and have connected systems and found that it is easier to work together by connecting systems. One example is we use sales automation technology called Outreach.io for sending marketing emails. We prefer sending emails from an individual human who deeply understand the prospects instead of mass email from marketing automation based nurturing. We have a connected tech stack with SalesForce being the hub and everything connects to it right from sales automation, Bizible for analytics or our direct mail platform. We use multiple technologies in our tech stack but connect into one place and that is really important. 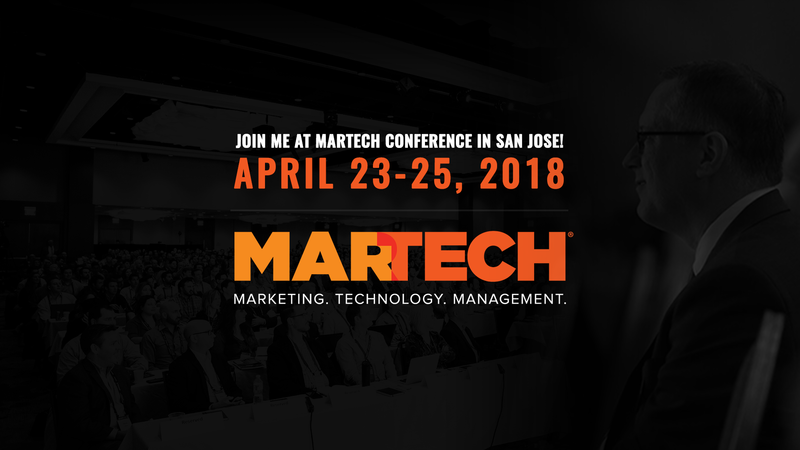 Scott Brinker‘s latest MarTech landscape infographic has over 5000 marketing technologies on it. I like to think about what are we do with the marketing tools and technologies to help us solve problems and not just buying tools for the sake of having multiple ones. Q6. Where is the attribution industry heading? People or companies are most focused on lightweight attribution measurement today. While this is a good start, it makes sense to continue the progress and move it to a complex model. It’s like riding a scooter or a skateboard to getting in a Formula One car. My advice is we need to measure many marketing touches and tie them to revenue. You don’t want to get hung up on what are usually small edge cases. By focusing too narrow, you are ignoring the macro improvement and only worrying about the one percent. Attribution at its core is all about looking at what has happened in the past. The interaction and sales outcomes have already happened. The important fact is to use these historical trends, so we can predict and change the future. If you’re not going to do anything with that data, it’s useless and it’s like actually spending money for something that you never get return on. At Bizible, we have that vision with our reporting system so we can go optimize and change the future. We have come to market with the first way to sort of take the historical data and help you forecast future trends. We want marketers to understand what is going on with their marketing spend and what actions they can take to improve the returns. Q7. You have founded a company called MarketingOps.com? Tell me more about that i.e. what is it about, what it does? Sure. I started Marketingops.com because I wanted to really learn from peers. I think I have learned a lot from blogs and podcasts courses but I have also learned a lot from others. You don’t always get the marketing ops stories in a public setting. I try to go find what’s working in the industry, and what’s not. I would like to know how this industry is changing. The role of marketing operations is gone from managing marketing to managing larger marketing operations and eventually managing the planning aspect. We have 500 members now who are sharing insights about tools and technologies. We just published our first research report called the marketing operations salary benchmark. It’s a useful report for marketing ops leaders to understand how much are they getting paid. My goal with Marketingops.com is to educate and help support the marketing operations industry and we’re technically a trade association. It’s a really fun community that I’m excited to be part of.